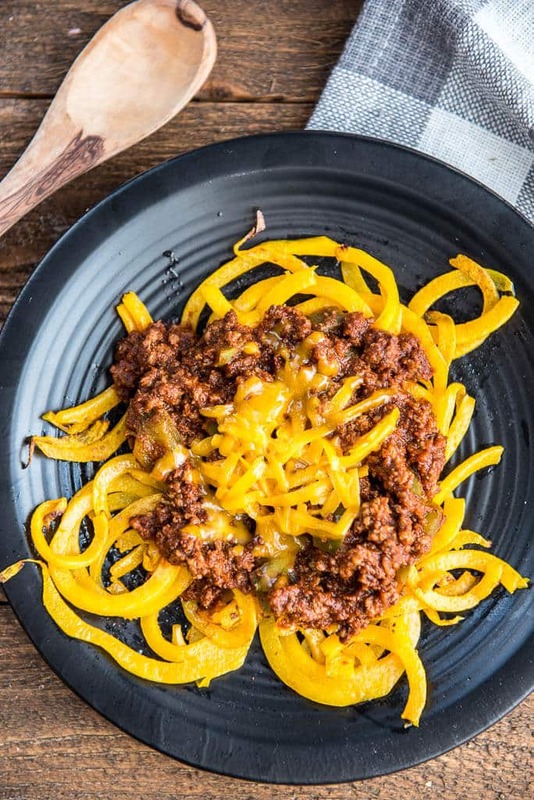 A homemade take on a beloved classic, Easy Skillet Cincinnati ‘Skyline’ Chili with Butternut Squash Noodles is packed with nutritious veggie noodles and is quick to make on the stovetop! 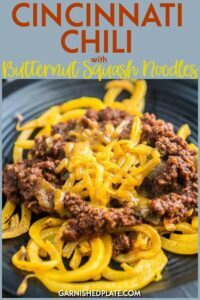 Hey there and welcome to my latest obsession, Easy Skillet Cincinnati ‘Skyline’ Chili with Butternut Squash Noodles! How I’ve gone my whole life and never known about this iconic dish called Cincinnati Chili, I’ll never know, but I’m thankful that last year I finally caught on to this craze and can I just say, I’ve yet to look back. I’ve made a slow cooker, more traditional version that we love, but I thought it time to make up a version for those nights where you need something quick and you want something a little more on the healthy side. 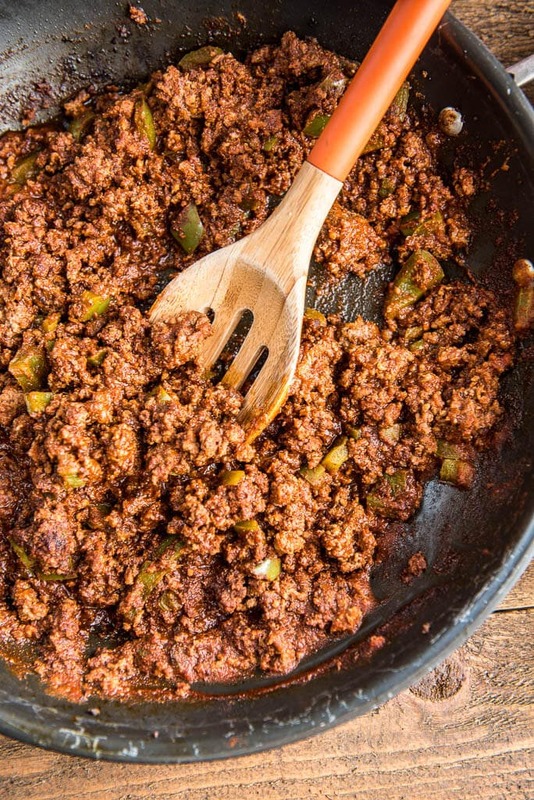 Obviously, this is not your standard chili. 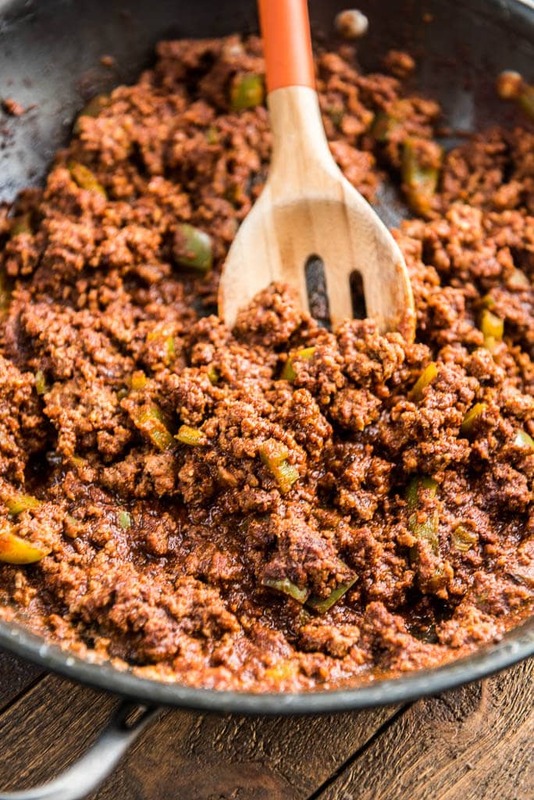 It’s more like a thick meat sauce packed with the most delicious flavors including the traditional chili powder but adding so much more. To keep this one quick to make, I went through the list of spices carefully deciding what would get to stay and what would have to go. Look up the various recipes and you’ll see a wide range of spices making this a unique dish, and I’ve kept only the absolute essentials here to create a dish with amazing flavor that doesn’t have to cook all day long. So what is in my magic spice blend that got to stay? Besides the chili powder and cumin, I added ancho chili powder for that smoky flavor, chocolate powder to offset the acidity in the tomatoes and make it taste rich, and finally all-spice, for that little something kick that will make everyone go “that’s different!”. Be sure to take note the completely beat up skillet I love that gets well used when I want a quick dish like this. I think everyone seriously needs a skillet like this in their life because it will give you so much mileage and be with you through so many dinners it will almost be a part of the family. Now, obviously you could use regular noodles, but if you haven’t tried it with butternut squash noodles I can’t recommend it enough. The sweetness goes so perfectly with the spice of the chili and my mouth is now watering thinking about it. 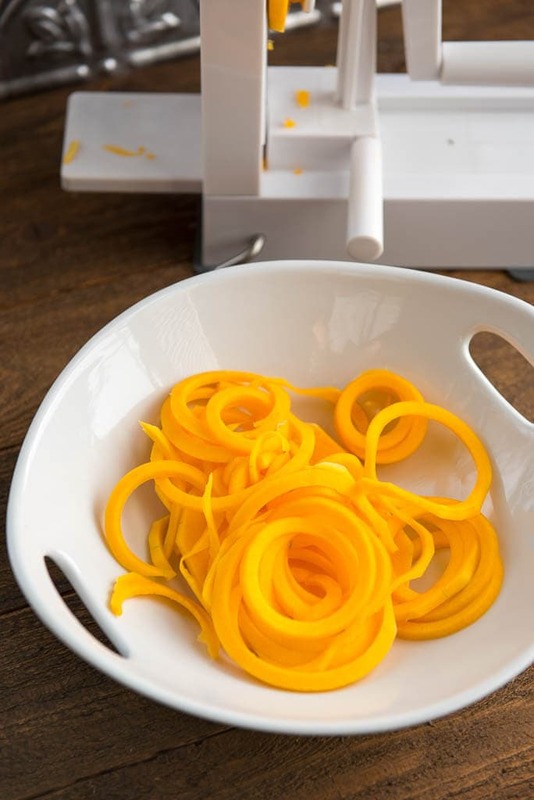 I’ve actually seen pre-spiralized noodles in the grocery stores lately, but they are pretty simple to make using a spiralizer and the the narrow part of the butternut squash. Any time I want to figure of IF something can be spiralized and how to do it, I head over to Ali from the site Inspiralized and she has all the answers. In fact, that’s how I learned to spiralize a butternut squash! or just scoop it up onto your favorite crusty bread! 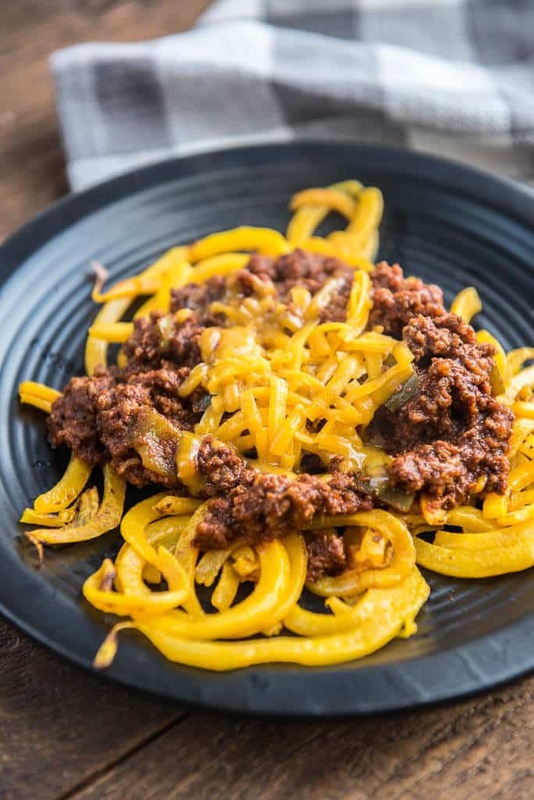 A homemade take on a beloved classic, Easy Skillet Cincinnati 'Skyline' Chili with Butternut Squash Noodles is packed with nutritious veggie noodles and is quick to make on the stovetop! Want to up the veggie intake even more? 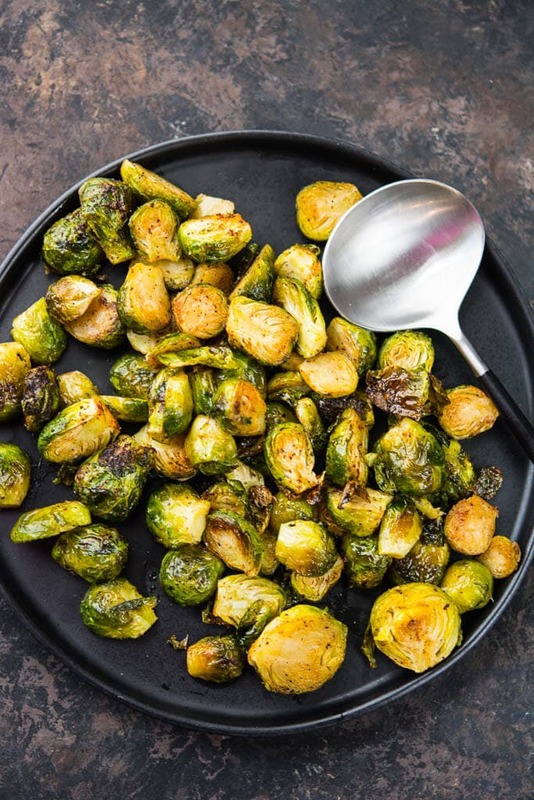 Serve this up with my favorite Brussels sprouts!